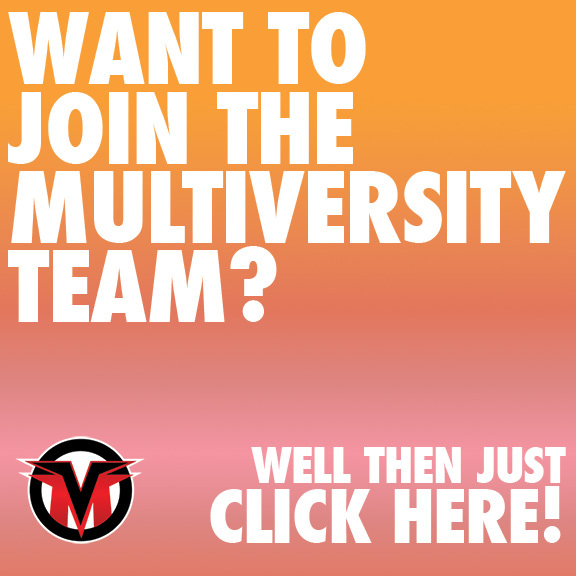 Welcome back to the inaugural edition of the Multiversity Manga Club! This month’s reading was the delightful “Jaco the Galactic Patrolman,” written and illustrated by the legendary Akira Toriyama. Originally serialized in the pages of “Weekly Shonen Jump,” “Jaco” is a delightful action comedy that pays homage to “Dragon Ball” and various popular manga tropes. If you’ve read the book along with me, as I hope you have, here’s your chance to read about my and others thoughts on the book, as well as leave a few of your own. Akira Toriyama, manga legend and creator of Dragon Ball Z, is back with the quirky comedy Jaco the Galactic Patrolman! Retired scientist Omori lives alone on a deserted island while continuing his research into time-travel. His quiet life is interrupted when galactic patrolman Jaco crash-lands and decided to move in with him. Can Jaco get along with the old man long enough to save the earth from a dangerous threat? There’s no denying the world spanning phenomenon that is the “Dragon Ball” franchise. The work has been extremely influential in both its manga and anime forms, as well as across countless other forms of media and merchandise. Yet, when returning to the world of “Dragon Ball” for the first time in nearly two decades, Toriyama chose to do so in the subtlest of ways. “Jaco” is here to tell its own story, one that is enjoyable in its own right, with no prior knowledge of “Dragon Ball” required. For those who are already acquainted with Goku and company, Jaco’s story, particularly the final chapter, is enriched even more. In tone, “Jaco” bears a much closer resemblance to the earlier chapters of “Dragon Ball.” In many ways, “Jaco” feels like the culmination, or rather the distillation, of much Toriyama’s dense body of work. In a powerful response piece, fellow Multiversity staff member Paul Lai touched on this; “I remember Dragonball being funny, but was it this funny? And was there this meta sense of humor about itself?” Having recently read through the opening bit of “Dragon Ball,” I can attest that the book was very funny and did occasionally attempt to break the four sided panels that enclosed it, quite literally at times. Toriyama presents the same irreverent but irresistible humor that made Goku so instantly lovable. Both leads share a goofy naivety and act as foils for their more worldly, street-wise companions. A humorous shift in perspective. Both the dialogue and the physicality of the characters exemplify some of the best dry comedic timing I’ve ever seen in a comic book. Toriyama’s gag involving colloquial terms from Jaco’s planet gets a laugh literally every time, partially due to the way Toriyama draws Jaco when delivering the line. You can see the coy smugness, the bridled jocularity of a child that’s just told a joke he or she knows is slightly off-color but (in their own mind) irresistibly hilarious. It’s this synergy between art and dialogue which in turn helps make it hilarious. In their spotlight on “Jaco” in Robots from Tomorrow, Mike and Greg called attention to this blending of art and story. Toriyama, like Darwyn Cooke or Mike Mignola, is a master class writer/artist, or cartoonist if you prefer, and as such knows the value of showing rather than telling. From the moment we set foot on Omori’s island, we learn things about his character. We get hints at his sadness, his grumpiness, and his humility. Sure, there’s a fair share of exposition, but it often grows organically from the character’s personality rather than the need to convey an idea or a plot point. The breadth of detail packed into each page makes Jaco’s world feel vibrant and alive. In a chapter in which Jaco and Omori head to the big city, background characters go about their lives, having conversations, watching television from the comfort of their homes. You get the sense that not a single pen stroke was wasted, that every line was placed with intention. For 200+ pages, this is a home you will come to know and love. And of course, being a Toriyama comic, the book’s action sequences are second to none. Jaco pirouettes through the sky with great ease, bringing a kinetic energy to even the mildest of sequences. I’ve spent a lot of time on the humor of “Jaco,” and with good reason. However, there are semi-serious plot thread running through Jaco. One involving a tired old scientist faced with losing his home, along with his last connection with his late wife, another follows a questionable shuttle launch manned by a pop idol. There’s Jaco’s own quest to fix his crashed ship and fulfill the mission he was tasked with. Toriyama juggles all these threads with a master-like ease, carrying plots to the forefront for a chapter while hinting at others in the background through off-hand bits of dialogue or the ambient drone of the television. The book’s pacing feels extremely tight, and the story clips along at such a breezy but enjoyable rate that the 240-odd page book can be enjoyed in a single afternoon. That sense of fun, ease, and enjoyability is arguably the defining trait of “Jaco the Galactic Partolman,” and what makes it so easily recommendable. I recently had a friend solicit me for recommendations for comics to grab from his local library. When asking what types of books he was interested in, he had a single qualifier; “I’m not really interested in the Japanese comics.” This sentiment, a disinterest or even aversion to manga, is something I’d like to help dispel through this Manga Club. Aside from the fact that it reads right to left, there’s nothing differentiating “Jaco” from any other well-made all-ages comic. In fact, the book’s prime distinction is that it’s better than most books of its ilk. When getting into manga, it’s important to not see the perceived incongruities, be they cultural, artistic, or thematic, as barriers to entry. Rather, view them as an opportunity to expand your understanding and appreciation of the medium you already love; comic books. Because, like the frequently misapplied term “graphic novels,” manga are still comics books, plain and simple. So, if you read and enjoyed “Jaco the Galactic Patrolman,” take a closer look at the manga section next time you head to your local bookstore. There’s a good chance it has a larger and more diverse selection than the graphic novel section and over a better value to boot. In the next week we will be announcing the Book Club selection for August, so keep checking back at Multiversity Comics. See you next month, you Super Elites!